Akinori Uesugi is a senior consultant in Freshfields’ antitrust, competition and trade group, based in the Tokyo office. Akinori started his career at the Fair Trade Commission of Japan in 1970. He held positions as deputy secretary general, director general of the Investigation Bureau and director general of economic affairs, before his appointment in June 2003 as secretary general, a position he held until the end of June 2006. During his time as secretary general, he played a key role in making significant amendments to Japan’s Antimonopoly Act; changes that have led directly to stricter antitrust enforcement in Japan. Kaori Yamada is a counsel in the Tokyo office with over 10 years practising in Tokyo and London. She specialises in all areas of competition law, including global cartel defence, merger reviews, investigations on unilateral conducts, competitor cooperation and various vertical issues across a broad range of industries, in particular the chemical, consumer goods, telecom, technology, energy, transport and healthcare sectors. Having previously worked at the Japanese Ministry of Foreign Affairs in the Treaties Bureau and Economic Affairs Bureau, her deep understanding of working effectively with the government makes her a trusted adviser for Japanese companies on their complex communications with the authorities. Akinori Uesugi & Kaori Yamada: The Japan Fair Trade Commission (JFTC) continues to want to bring economic analysis into their review. They are still very selective in their use of economic analysis, and there are cases – particularly where the JFTC eventually decided to clear without any conditions – where the parties’ submission of their own economic analysis does not receive any particular feedback from the JFTC. However, it has been reported that there was reasonably active dialogue on economic analysis during the review of some recent cases. Going forward, especially in cases where remedies are potentially necessary, preparing economic analysis upfront as additional means of defence will increasingly make sense. This is consistent with the trend we are seeing with many other antitrust regulators internationally. Another noticeable development is that the JFTC has started to search for potential gun jumping cases, although no penalty cases exist yet. Interestingly, we have started to hear from various companies where the JFTC contacted the transaction party, once a high profile transaction was announced in newspapers and other news media. JFTC officials make phone calls or send emails to those transaction parties asking whether they intend to file with the JFTC, in order to make sure there is no gun jumping. Even foreign-to-foreign transactions are not exempted from this new practice – if anything, it feels to us as though international deals are attracting more attention from the JFTC. Companies that received such a call or email would have to respond by saying, ‘Yes, we will file, don’t worry’, or elaborating on the reason why they have decided not to file. Clearly, this new practice demonstrates the increasing appetite of the JFTC to chase gun jumping and to be involved in multi-jurisdictional merger review of global deals. Interestingly, the JFTC announced a strong ‘warning’ to one Japan–Japan acquisition case about gun jumping. The transaction itself was cleared without any condition, but the two-step transaction structure was considered as impermissible intent to avoid the filing – the first step was the acquisition by a ‘shell’ entity, that appeared to be independent, of the actual acquirer, to avoid the JFTC filing at that stage, whereas in the second step the real acquirer indeed acquired the target following the JFTC clearance. It is interesting to note that this case was imposed a penalty by the Chinese authority as gun jumping. The JFTC continues to be conscious of other overseas regulators. During its merger review, the JFTC is increasingly conscious of what other overseas regulators are thinking. This trend is nothing new, but particularly where new technical issues, such as vertical foreclosure risk of potential new products, are involved, the case team tends to ask after the review progress and views of other regulators. To reflect this, we are seeing more cases where the JFTC requests a waiver from the parties for the JFTC and overseas regulators (especially EU and US) to exchange submitted documents and information between each other. The JFTC’s desire for more internationally coordinated review processes affected their own review methodology. Like many other mature regulators, the JFTC has been putting more weight on market tests even for a Phase I case. We are seeing various cases where the JFTC’s scrutiny was stepped up after customers or competitors raised concerns during market testing. Market testing is often conducted before Phase II, even during pre-notification discussions. Also, the JFTC has started to request internal documents from parties that would reveal the parties’ rationale or other intentions towards the transaction, and market assessment. The JFTC follows the global trend where various regulators adopt the US-style ‘investigation of evidence’ rather than using the assessment done by the parties’ counsels as a starting point. Finally, we have been hearing strong concerns from antitrust practitioners that the JFTC raises too many, often unnecessary, questions during their merger review. This trend still continued over the past 12 months. Often the questions are far-reaching and detailed even in a totally non-issue case, and counsels seem to be regularly fighting back such demands. Interestingly, the JFTC used to receive similar criticism, but the issue appeared to have been resolved by their internal efforts several years ago. However, we are seeing a comeback of this problem again, and in some recent no-issue global transactions, after a few hundred questions during pre-notification discussion, Japan ends up in one of the last jurisdictions to be cleared. This is an unpleasant surprise for foreign companies, who would normally expect Japan to be a ‘reasonable’ jurisdiction, distinguished from more ‘difficult’ jurisdictions. 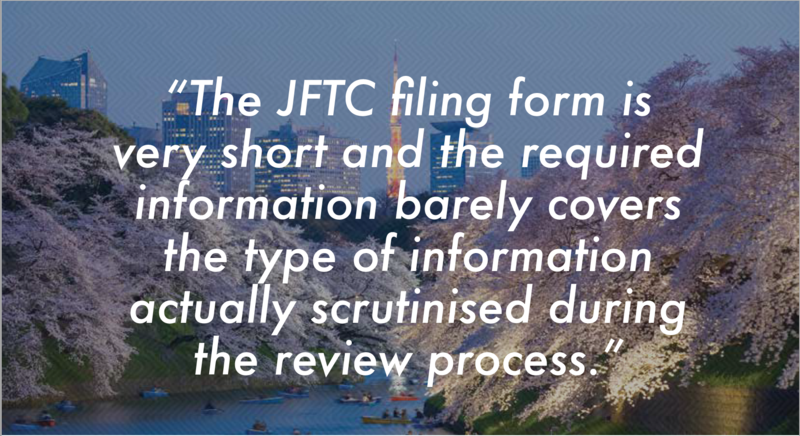 AU & KY: The JFTC filing form is very short and the required information barely covers the type of information actually scrutinised during the review process. Often lawyers in other jurisdictions are surprised to see the JFTC form, as in most other jurisdictions parties are required to disclose various market information and describe the issues at a granular level in narratives under the threat of severe sanctions against false statements. The JFTC form requires ‘market shares’ of the parties and competitors, but the parties are not required to explain why and how they decided on the market definition. On the other hand, there are a number of peripheral pieces of information – such as total assets or number of employees of the direct party to the transaction (which can be a mere acquisition vehicle or holding company) rather than the group company involved – which are not at all essential for the actual merger review. This severe discrepancy between the form and the actual review is often criticised. As a result, particularly in a potentially problematic case, it is essential for the parties to be proactively creative and submit additional briefing notes in order to make up for what is missing in this somewhat disarrayed notification form. Without this extra effort, the case team – who would otherwise have a very tough time initially trying to understand where the actual issues are with very little substantive information available at hand – tends to ask rounds of questions at a pre-notification stage, which delays the process significantly. By presenting up front the parties’ proactive arguments, unnecessary delay can be minimised and the parties can keep at least some control of the process rather than being entirely passive. We experienced some cases, including over the past year, where the seller’s counsel chose not to provide an initial comprehensive briefing note, and as a result the JFTC spent a long time trying to understand the relevant issues with rounds of questions, some of which were not in fact directly relevant to the assessment. JFTC case teams are generally very understanding and would try to get on with the review as efficiently as possible, despite the unhelpful filing form. It would be important for the parties to understand the ‘defects’ of the JFTC filing form, and to try to facilitate the review proactively. AU & KY: As mentioned in the previous question, a clear message is being sent that the JFTC has a strong appetite to be involved in the multi-jurisdictional review of global M&A deals. It is therefore important to show that the parties are taking the JFTC review seriously – for example, it would be a very bad practice to make progress with the review in other jurisdictions and bring the case to the JFTC for the first time much later than other jurisdictions. We have seen cases where the JFTC case team expressed much discomfort at the fact that the parties ignored the JFTC for several months while other overseas counterparts were already reviewing, and nevertheless the parties pushed for a prompt clearance from the JFTC. There is no publicly announced ‘industry-focus’ regarding the JFTC’s review policy. However, we observe some increased interest in the IT industry generally, in both software and hardware. The case team really tries to understand how the industry works, including significantly more details than other authorities would require, which often creates surprises for foreign notifying parties. This trend is likely to reflect the current overall interest in this sector, where the JFTC has been conducting various market surveys. Also, there is a view that the JFTC’s scrutiny tends to be stricter in cases where Japanese companies or consumers are impacted. For example, since the 2011 Tohku Earthquake, which caused a significant shake up to the country’s policy towards nuclear power generation or energy policy in general, we are seeing slightly more focused and intensified review by the JFTC in the energy sector, ranging from upstream to downstream. This tendency is often fuelled by media exposure. When a large energy-related transaction, international or domestic, is announced, newspapers or magazines tend to comment extensively, often negatively, which would directly affect the level of JFTC scrutiny. In the energy sector, other governmental agencies – such as the Ministry of Economy, Trade and Industry (METI) – are also pushing various policy messages, and in some cases, we have experienced that the JFTC ‘considered’ – or was affected by – such other agencies’ report. Among all the elements that would cause an enhanced review by the JFTC, media spotlight is often the most unpredictable and, therefore, risky factor. Criticism or concerns expressed in public media could trigger unexpected scrutiny, and there have been cases where we were taken aback by the aggressive scrutiny by the JFTC, which would initially appear to be an overreaction because the pure market share and other facts did not indicate any issues and only later would we discover the reason: bad exposure in various industry magazines. AU & KY: As stated in the first question, although it is not ‘evidence’ as such, the JFTC’s efforts to engage in more economic analysis continues. Economic evidence such as price-modelling will be increasingly relevant in difficult cases going forward. Another notable recent development has been that the JFTC has started to ask for ‘internal documents’, which has long been the focus among the various submissions in US Hart–Scott–Rodino filings and has been increasing its profile in EU Commission reviews. By contrast, the JFTC used to be quite relaxed when it comes to internal documents. Clearly this is a new trend, reflecting the overseas authorities’ prevailing practice. This approach has continued over the past 12 months. So far, the JFTC has not made the submission of internal documents a mandatory requirement. Rather, these internal documents – more specifically, internal documents and reports analysing rationale and market conditions, submitted at the senior management level – were requested in a more informal way. Unlike the US or EU, therefore, the parties are technically not subject to the risk of sanctions for incomplete submission. One of the issues we would need to consider carefully is the translation issue. The volume of such internal documents can be significant, and translating everything diligently can create material translation workload, thus time and cost. As far as the request is made in the context of information process (ie, pre-notification discussion) there is scope for negotiation with the case team. We would expect this new trend of the JFTC to become more common, particularly in view of its increasing preference to speak to US and EU authorities via a waiver letter. During its communications with overseas authorities, the JFTC would naturally encounter various mentions about such internal documents, especially problematic documents, and it would be a matter of time before the JFTC would start to consider that internal documents are a critical part of the review. AU & KY: Apart from abandoned cases where the JFTC terminated their review as a result, there have been no recent cases published where the JFTC’s review ended in a prohibition. The number of Phase II cases is also significantly low compared to other major jurisdictions, although this may be to do with the JFTC’s or the parties’ efforts to make substantial progress in the review at a pre-notification stage in order to avoid the extra procedural hassle in Phase II, or the mandatory disclosure of the case on the JFTC’s website at the start of Phase II. There have been a small number of cases where remedies were required, but the type of remedies imposed by the JFTC tends to be more flexible compared to other regimes, allowing more creative behavioural measures. It is therefore important in JFTC merger reviews not to give up easily even in the face of very negative market share data, and to take advantage of every possible defence argument and explore less intrusive remedy alternatives. Those efforts, which may not be accepted by overseas authorities, may be accepted by the JFTC. In some high-profile Japan–Japan cases, the JFTC scrutinised them but the conclusion itself was very lenient, compared to the international standard. Significant shares were justified on the ground of various theories, such as import pressure, or ease of new entries. Even where remedies were required, in many cases the JFTC avoided structural remedies and compromised with behavioural, less intrusive remedies. A complete prohibition has been almost ‘unmentionable’. With the JFTC’s strong wish to internationalise their enforcement, such a relatively lenient approach may not be an option any longer, but at least at the moment it is still worthwhile to explore such less strict remedies in front of the JFTC, especially in cases where Japan is the only problematic jurisdiction. AU & KY: Just as the JFTC’s practice is evolving, the types of mergers available in the market to be reviewed by the JFTC are also changing. In the face of demographic challenges within the country, in some industries the Japanese domestic market is saturated with a significant prospect of active M&A trends to rationalise the deadlocked market structure. A high market share will inevitably be a feature of such mergers. Until recently, the number of horizontal mergers directly affecting the Japanese market was relatively limited compared to the US or European market. But with the rapid increase in potentially complex mergers brought to the JFTC for review, the JFTC would have to update their review policy and also staffing. For example, more experienced staff would be crucial to be able to handle highly sophisticated cases – both in terms of antitrust knowledge including what is happening in overseas jurisdiction, as well as sufficient communication skills to interact with other authorities. There is no doubt that the JFTC’s review will converge to meet international standards. Based on what they have been doing in other aspects of policy reforms, it would be more likely that more EU style methodology is incorporated into the JFTC system. We mentioned in a previous question that the current filing form is entirely out of date and does not capture the actual needs of the review process, resulting in cumbersome rounds of sporadic, unorganised questions from the case team. This is one area where we do hope for further reforms, and we believe the change will happen sooner or later. In fact, some case handlers have started to request upfront submission of a comprehensive briefing, which is to cover more or less the same contents as the EU filing form. Another area where we are likely to see changes in the JFTC practice would be remedy requirement. With increased exposure to global transactions, the JFTC knows that their current inclination to more leniency behavioural remedies is not consistent with the global standard. It is a matter of time, we would expect, before the JFTC’s policy transforms into more strict, structure-based remedies. If this happens, as often seen in the US and EU, there will be more spin-off M&A deals caused by the JFTC’s remedy requirement, which will further activate the M&A market in Japan. Increasingly, global coordination is becoming one of the key qualities required of antitrust lawyers. This is already an old story for lawyers acting for US or European companies, but the global strategy of many Japanese companies has brought this same demand into the Japanese legal market too. Detecting what the case team wants and facilitating their review, rather than ‘fighting’, is the key strategy for moving forward with a smooth review process. This does not mean compromise – friendly relationships allow us to be assertive about where we need to stick to our position. Many of the global transactions in the healthcare and pharmaceutical sectors have been reported in Japan, and these matters tend to require extra efforts due to the larger than usual number of questions from the JFTC.